Sportswear manufacturer Puma is the new sponsor of the Israel Football Association (IFA). 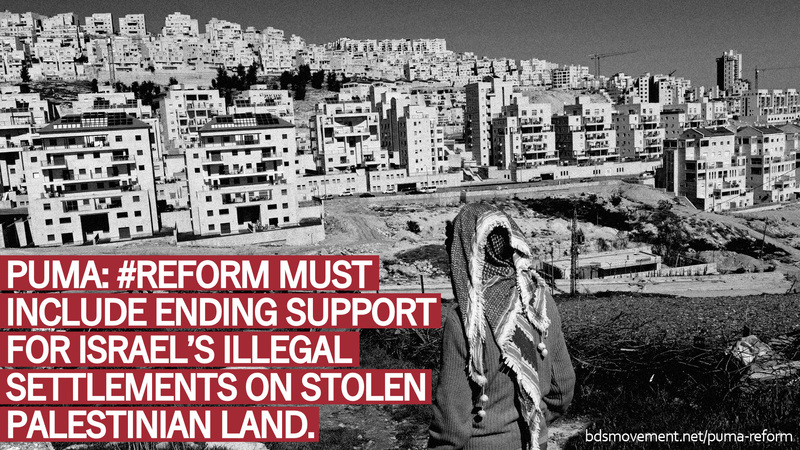 The IFA includes teams in Israel’s illegal settlements in the occupied Palestinian West Bank. Puma replaced Adidas as news broke that Adidas would no longer be sponsoring the IFA following an international campaign. More than 200 Palestinian sports clubs have now called on Puma to end the sponsorship deal and stop supporting Israel’s illegal land grabs. Let’s stand with them. Today, Tuesday, October 16, Puma is launching its #REFORM campaign to drive social change. Let’s tell Puma it can’t “encourage conversations around issues such as universal equality” while sponsoring teams in illegal Israeli settlements that push Palestinian families off their land. Puma has enlisted athletes and artists committed to social change in its #REFORM campaign, including Olympic gold medalist Tommie Smith, who, together with fellow medalist John Carlos, raised his fist in protest of racial injustice at the 1968 Olympics. Today, Puma is calling for people to post photos of themselves with raised fists. 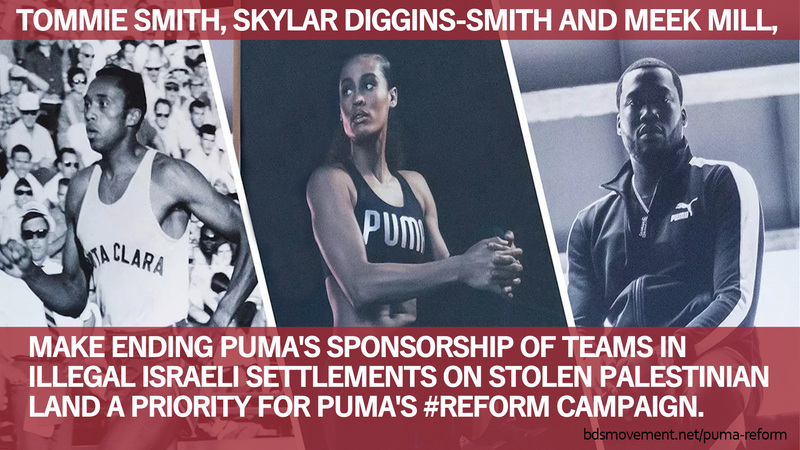 Let’s thank Tommie Smith, WNBA player Skylar Diggins-Smith and rap artist Meek Mill for their commitment to social justice and urge them to make ending Puma's sponsorship of Israeli settlement teams a priority for Puma’s #REFORM campaign. Use the sample tweets and memes below with Puma’s #REFORM and #THIRDSALUTE hashtags. Together we can push for meaningful social change for all.